There’s also a certain amount of irony in a 6-foot-3, 230-pound State Farm insurance agent who loves to crash full-speed into other guys on the football field. And Vossmeyer loves football. If afforded the opportunity, he’d be behind center, reading the opponent’s secondary, motioning his tight end, shouting an audible, barking a hard count as 50,000 fans cheer. He’d be the leader, the guy everyone trusted. But you don’t always end up where you expected. 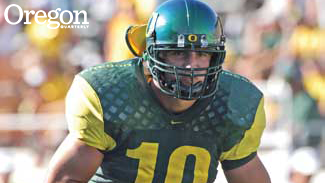 The former University of Oregon quarterback and linebacker got serious about football in his junior year at Crescenta Valley High School in La Crescenta, California, not far from the Rose Bowl. Physically gifted, with both size and speed to go with a rocket launcher for an arm, the versatile prep player impressed his coaches on both offense as quarterback and defense as a linebacker. He was soon dreaming of playing football at the next level. His first goal–egad–was USC, the alma mater of many of Vossmeyer’s relatives. “When you grow up in Southern California, USC was one of those things. It’s where people wanted to go,” recalls Vossmeyer from his office in La Cañada, California. In his first game as starting quarterback for La Crescenta, he had a great first half. He broke his leg in the second half. His recruitment got put on hold. He returned his senior season and set the school record for passing yards. But USC fired Vossmeyer’s recruiting coach and the university stopped calling. Dreams of Trojan glory were not to be. Vossmeyer fell in love with Oregon and picked the Ducks over schools that would have offered him a chance to start immediately. And that was a problem: the Ducks were stacked at quarterback. There was Joey Harrington ’01, a future first-round draft pick and Heisman Trophy finalist. Harrington’s backup was eventual NFL quarterback A.J. Feeley ’00. Then Jason Fife (who played in the NFL) and Kellen Clemens ’05 (you guessed it: NFL) split time as starter before Clemens took over. Vossmeyer languished on the bench while logging time on special teams. Going into his redshirt junior season, he knew he wouldn’t get a chance to start. Frustration set in, and Vossmeyer realized he would have to switch positions for a chance to play. And hey, he liked hitting guys. A torn knee ligament sidelined Vossmeyer his junior year, but it all came together when he was a senior. Finally. Vossmeyer loved his time at Oregon. The team took trips to places like Lake Shasta every summer, and the players were very close, he says, like family. After he graduated with a degree in public relations, Vossmeyer knew that playing in the NFL wasn’t realistic. Despite his physical gifts, his lack of playing time meant he wasn’t getting much attention. There are, however, other options for a collegiate player looking to play professionally. He talked to former Ducks who had played in Germany and decided he wasn’t ready to hang up the cleats. The one season Vossmeyer spent in Germany, alas, didn’t go as planned. He returned to quarterback, but before the season even started the team’s entire starting offensive line had been sidelined with injuries. He often found himself at the mercy of defensive linemen who seemed hell bent on killing him. “I was running for my life,” he says. The team finished with a three-and-nine record; Vossmeyer finished with a separated shoulder. “In the beginning, it was all about football,” Vossmeyer says. “I wasn’t satisfied about how everything ended at Oregon. I wanted another chance to go out there and throw the ball and prove to myself that I could still do it. “But once I was there and I started to get beat up, it became more about being there and appreciating it. Of all the European countries—many of which have at least one football league—Germany has most enthusiastically embraced the game. “The crowds there would have those old World War II bombing sirens that you’d crank, and they’d be blasting those when the other team was on offense. And it’d just be,‘Reeeeeeeeeeowwwwwwww,’” Vossmeyer says, laughing. It wasn’t Autzen, or the NFL, but it was special. After the season, he returned to Southern California and had a decision to make: Have shoulder surgery and play for an arena team that was interested in him or get started on his off-field career? He chose to follow in the footsteps of his father, Richard, a State Farm agent for thirty-one years. Today, Vossmeyer has completed the long agent-certification process. September 1 marks his one-year anniversary; business is good. But is he satisfied with how his life has turned out? “I’ve learned to live with it, is what I would say. You know, I would’ve loved a shot at playing at the next level, and seeing if I could compete. “It’s hard for me to look back and say, ‘Yeah, I wish I would’ve done that.’ Because my experience at Oregon was so great and the people I met in Germany and everything else. And that’s the salve: coaching. In his spare time he works with local high school quarterbacks. Even though Pellum and Tedford know firsthand about Vossmeyer’s . . . aggressive . . . nature, they both gave the same answer when asked if they’d buy insurance from him.